(Nanowerk News) Every time you stroll outside you emit energy into the universe: Heat from the top of your head radiates into space as infrared light. Now three Stanford engineers have developed a technology that improves on solar panel performance by exploiting this basic phenomenon. Their invention shunts away the heat generated by a solar cell under sunlight and cools it in a way that allows it to convert more photons into electricity. The work by Shanhui Fan, a professor of electrical engineering at Stanford, research associate Aaswath P. Raman and doctoral candidate Linxiao Zhu is described in the current issue of Proceedings of the National Academy of Sciences ("Radiative cooling of solar absorbers using a visibly transparent photonic crystal thermal blackbody"). The group's discovery, tested on a Stanford rooftop, addresses a problem that has long bedeviled the solar industry: The hotter solar cells get, the less efficient they become at converting the photons in light into useful electricity. The Stanford solution is based on a thin, patterned silica material laid on top of a traditional solar cell. The material is transparent to the visible sunlight that powers solar cells, but captures and emits thermal radiation, or heat, from infrared rays. "Solar arrays must face the sun to function, even though that heat is detrimental to efficiency," Fan said. "Our thermal overlay allows sunlight to pass through, preserving or even enhancing sunlight absorption, but it also cools the cell by radiating the heat out and improving the cell efficiency." In 2014, the same trio of inventors developed an ultrathin material that radiated infrared heat directly back toward space without warming the atmosphere. They presented that work in Nature, describing it as "radiative cooling" because it shunted thermal energy directly into the deep, cold void of space. In their new paper, the researchers applied that work to improve solar array performance when the sun is beating down. The Stanford team tested their technology on a custom-made solar absorber - a device that mimics the properties of a solar cell without producing electricity - covered with a micron-scale pattern designed to maximize the capability to dump heat, in the form of infrared light, into space. Their experiments showed that the overlay allowed visible light to pass through to the solar cells, but that it also cooled the underlying absorber by as much as 55 degrees Fahrenheit. For a typical crystalline silicon solar cell with an efficiency of 20 percent, 55 F of cooling would improve absolute cell efficiency by over 1 percent, a figure that represents a significant gain in energy production. The researchers said the new transparent thermal overlays work best in dry, clear environments, which are also preferred sites for large solar arrays. They believe they can scale things up so commercial and industrial applications are feasible, perhaps using nanoprint lithography, which is a common technique for producing nanometer-scale patterns. "That's not necessarily the only way," said Raman, a co-first-author of the paper. "New techniques and machines for manufacturing these kinds of patterns will continue to advance. I'm optimistic." 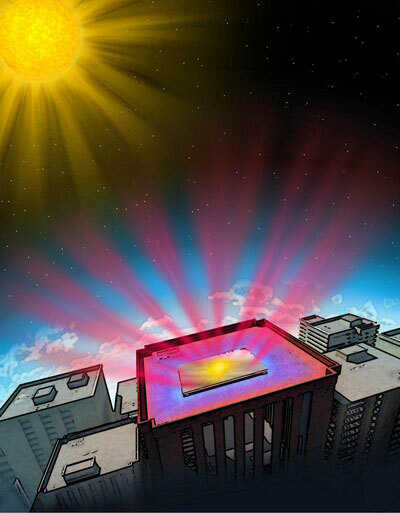 Zhu said the technology has significant potential for any outdoor device or system that demands cooling but requires the preservation of the visible spectrum of sunlight for either practical or aesthetic reasons. "Say you have a car that is bright red," Zhu said. "You really like that color, but you'd also like to take advantage of anything that could aid in cooling your vehicle during hot days. Thermal overlays can help with passive cooling, but it's a problem if they're not fully transparent." That's because the perception of color requires objects to reflect visible light, so any overlay would need to be transparent, or else tuned such that it would absorb only light outside the visible spectrum. "Our photonic crystal thermal overlay optimizes use of the thermal portions of the electromagnetic spectrum without affecting visible light," Zhu said, "so you can radiate heat efficiently without affecting color."